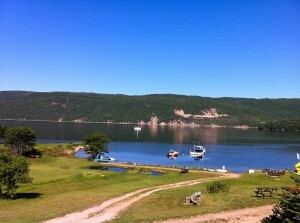 Cape Breton Cottage rentals on the Bras d'Or Lakes, N.S. Our Cape Breton pet friendly cottage rentals are centrally located in Big Bras d’Or, you can enjoy all the island has to offer. Come and hear our Celtic music, as well as experience whale watching; the best golf course in the world; or have a great lobster supper, all within a short distance from the cottages. Go for a 2 minute walk along the shore to the Factory Wharf and buy lobster or crab (in season) from the fishermen who bring them in from the daily catch. Fall is upon us and fall will soon be here, we still have openings. Just email us or give us a call 902 565 8907. Please click on ‘OUR COTTAGES’ in the menu to see the interiors of the cottages. As well, remember to look at our live webcam to see the summer developing into the fall at the cottages. Our cottages are centrally located on Cape Breton island, so we are only 10 minutes away from getting on the Cabot Trail. As well, we are half way between Baddeck and Sydney (30 minutes) and only 10 minutes from North Sydney and Sydney Mines where there is shopping for anything you may need. Why risk your vacation? Unlike some cottage rentals on Booking.com or VRBO, we are provincial inspected and regulated so you get quality accommodations during your stay. 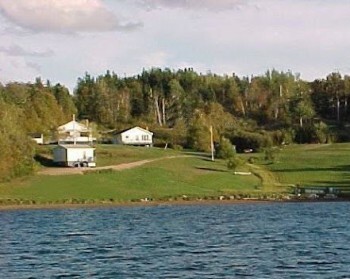 We have fully equipped, non smoking cottages (inside) and you’ll find them nestled on 6 acres overlooking the lake and the ocean on beautiful Boularderie Island, Cape Breton, Nova Scotia, Canada. There is a private sandy beach on the property for swimming and/or boating. Perfect for a quiet and relaxing getaway or a romantic vacation. ‘View of the Sea’ provides a beautiful setting to enjoy and explore all the beauty of Cape Breton Island.